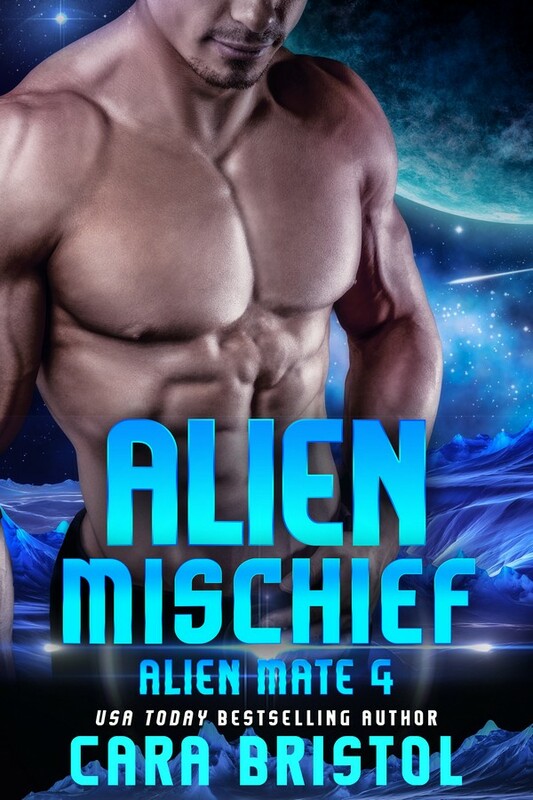 ← Thank you for a “hot, hot, hot” release day for Krinar’s Desire! Here’s a look inside my world and were the magic happens. This is my desk. I like the minimal distractions afforded by facing a wall of inspiration. I have a VeriDesk which I love. One must be careful, however, not to squish the cat when putting it down. My space isn’t an office so much as a cave off my kitchen/dining area. 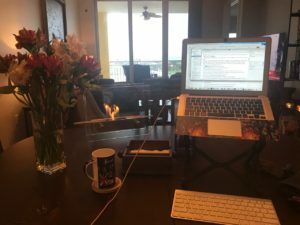 When I do, feel like a view (but don’t feel like going to Starbucks or some other venue) I frequently move over to my kitchen table with my Roost laptop stand. That thing is a neck saver. 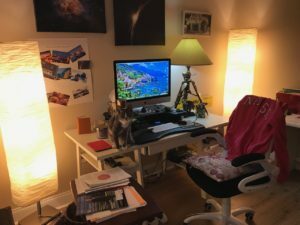 This was my setup while keeping an eye on hurricane Emily. 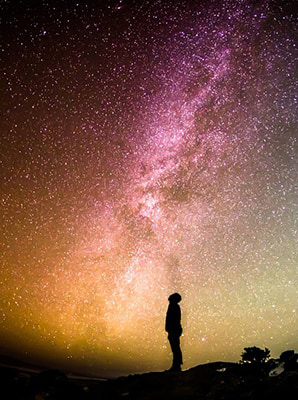 She wanted to be an astronaut and travel the stars. She ended up an Electrical Engineer and Cultural Anthropologist. She’s a geek with heart. 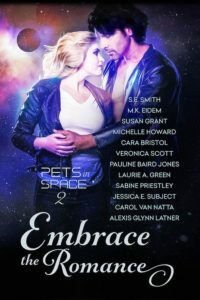 Sabine is the author of Sensate, a novella in the Alien Attachment series in Embrace the Romance: Pets in Space 2. Release date: October 10, 2017 ~ Preorder now! 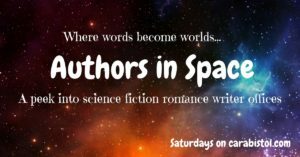 Try the FREE sampler containing the first chapters of all the Pets in Space stories. Download here. 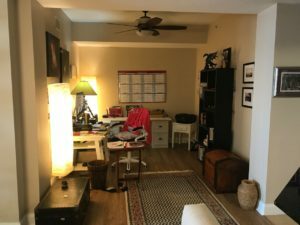 Want to see more author offices? 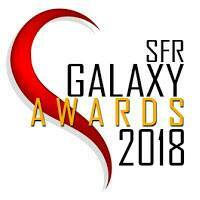 This entry was posted in Guest blogs and tagged author offices, Authors in Space, cats of writers, Embrace the Romance: Pets in Space 2, ergonomic offices, habits of writers, home offices, Pets in Space, Sabine Priestley, Sensate by Sabine Priestley, VeriDesk. Bookmark the permalink. Every cat deserves her fifteen minutes of fame. I like it, too. I sit way too much. I’m not sure I could write standing up, but love the office! Can’t wait for readers to get the chance to dive into your story! So much fun! I think there would be a learning curve. 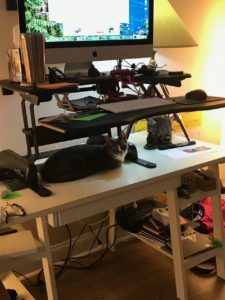 Love your office space, Sabine! My former boss used to do all her work standing up. She swore it avoided neck and back pains. My current set-up wouldn’t allow it but on some of my more antsy days, I think I just might do better working on my feet.